Palanganda Saroja Annaiah is a homemaker from Bangalore. She says Choute Pachchadi is a traditional Kodagu dish which is served with palav or ghee rice. Choute Pachchadi can also be eaten with plain white rice and pandi curry (Kodagu pork curry). 1. ½ Coconut – grated. 6. Curd 1 small cup. Lemon juice 2 table spoons. METHOD: Grind coconut, garlic, green chillies and salt to fine paste. Cut cucumber into small pieces and grind it. Mix together the coconut paste, cucumber, and lemon juice if using. Transfer the Pacchadi /chutney into a serving bowl. Heat 2 tablespoons of oil in a pan and add mustard. Allow it to splutter. Add curry leaves, red chilli and coriander leaves. Then pour it on the pacchadi in the serving bowl. 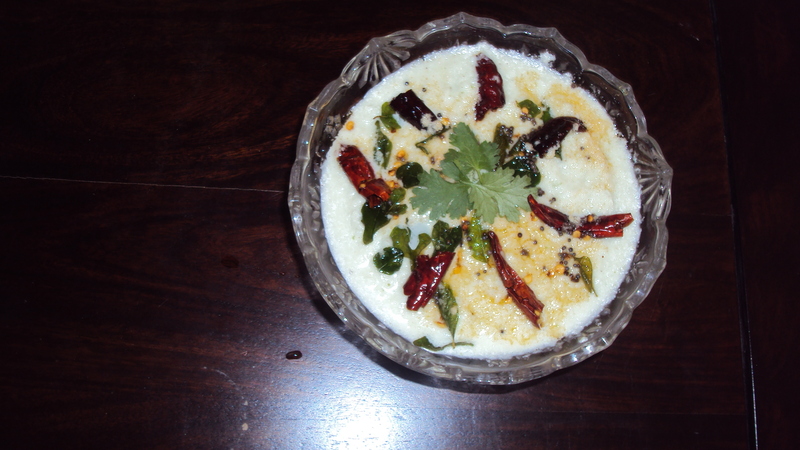 In the end, add curd to the pacchadi and mix well using a spoon. *Choute is a type of field cucumber, with less moisture and tougher flesh than most commercially grown varieties. If using the latter, finely grate the cucumber, and squeeze out a little of the liquid before using. very nice recipe prepared more often in summer all will love it. Nice. I miss it now a days. Thank you so much for sharing such a wonderful recipe.